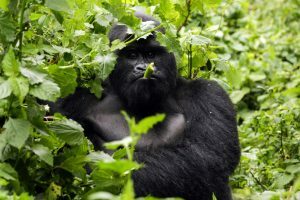 Welcome to the Virunga National Park, an oldest Africa safari park. We’re now reaching the halfway point in Angèle’s Marathon campaign, with just over 2 weeks to go until race day! On April 22nd, Angèle will take on the grueling 26 mile (42 kilometer) run through London. 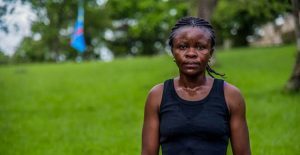 Even though running is all part of a day’s work as a ranger in Virunga National Park, Angèle has been stepping up her training, and she is looking likely to complete the run in a great time! However, her real test will be leaving her home for the first time, to travel to a new country and city, where she doesn’t speak the language. The kind words Angèle has received throughout this campaign, along with generous donations, has shown she has friends around the world encouraging her. This support will be crucial as the training gets tougher and the realities of the race sink in. As well as warm wishes shared by the parks friends, all the park rangers have been a tremendous support to Angèle, running by her side as she trains and cheering her on. Angèle is running this year’s London Marathon to raise much needed funds for the park’s programmes, and to support her brave colleagues who work tirelessly to protect the communities and wildlife of Virunga. 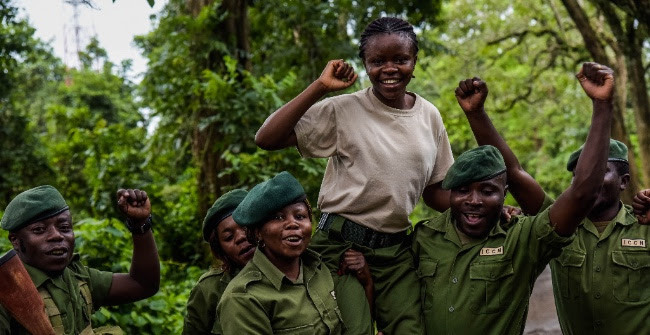 The marathon is an opportunity for Virunga’s community across the globe to come together to support the park, and support one of the extraordinary rangers. If you are interested in joining us on race day, please complete this survey with your details, and we will get in touch with details of how you can show Angèle your support.